Saturday 15th: Knocking on doors and talking to people in the Penny Lane triangle area, followed by delivering a welcome letter to newly registered residents in the L18 area of the ward. Sunday16th: Lawrence spent most of the day helping with the RHS National Gardens Scheme event at 6 Croxteth Grove, part of the Sefton Park Gardens collection. 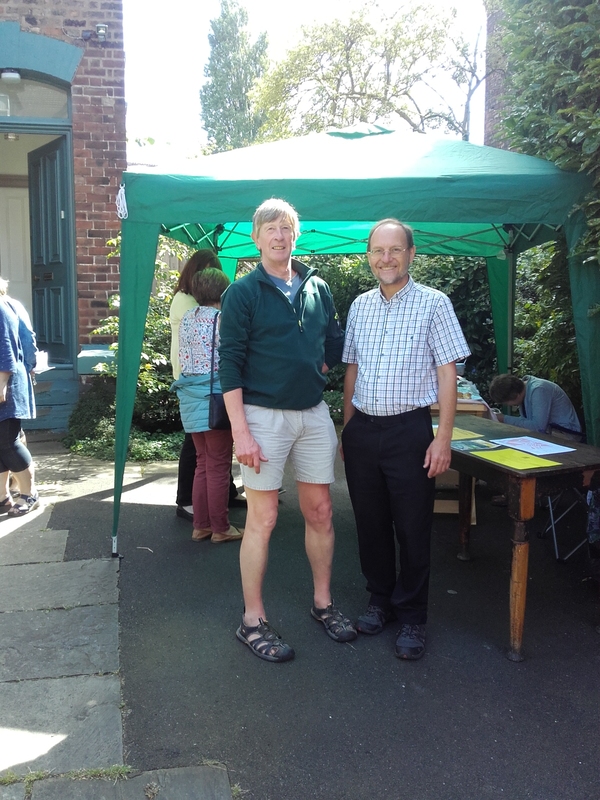 Cllr Brown was hands-on with issuing tickets and serving tea and cakes (see attached photo). This forms part of the ‘community duties’ of a local councillor. Monday 17th: Lawrence spent most of the day in The Toxteth Avenues Conservation Area, picking up casework. He reported 30 ‘actionable’ items to Liverpool Direct. In the evening, Lawrence attended the TANN Residents’ Association meeting. (“TANN” is “The Avenues Neighbourhood Network”). Tuesday 18th: Lawrence attended the City Council’s Planning Committee in the morning and early afternoon to oppose two planning applications for permanent developments on designated areas of Green Space (under the UDP 2002) – Sefton Park and Hope University. He spent the remainder of the afternoon in the Dales area picking up casework. There were 40 actionable items to report to Liverpool Direct. On Tuesday evening Lawrence attended a meeting of The Dales Residents’ Group. Wednesday 19th: Lawrence attended the “ L1578” community meeting in the early afternoon followed by the meeting of the full City Council from 5pm to about 8.20pm in the Town Hall. At that meeting, he seconded an amendment seeking an urgent review of extra money paid to councillors who are members of the City Region Transport Committee. These additional allowances total £206,000. 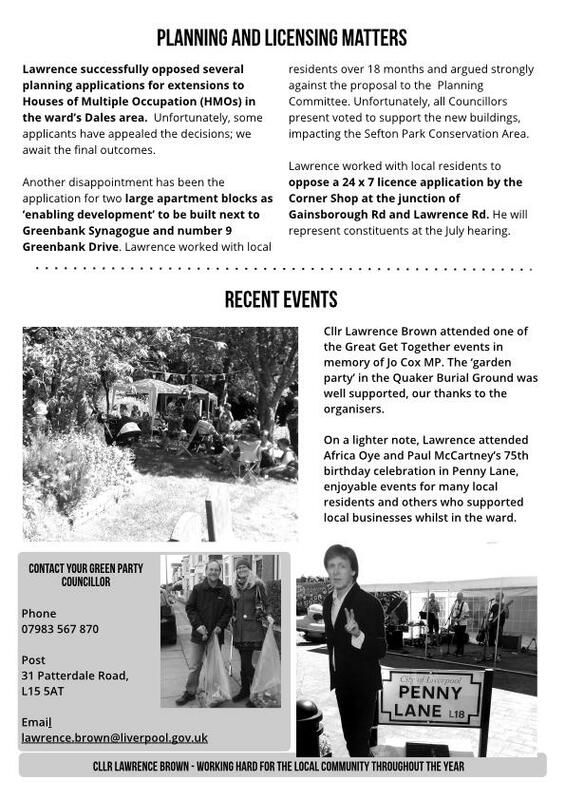 Unfortunately, the Labour councillors voted down that amendment, but Lawrence is determined to make sure other ways are found to look into these handouts to councillors. Thursday 20th: A day devoted to catching up with many emails from and on behalf of local residents, including objections and comments made regarding planning applications. And in the evening Lawrence was again knocking on doors and talking with residents. 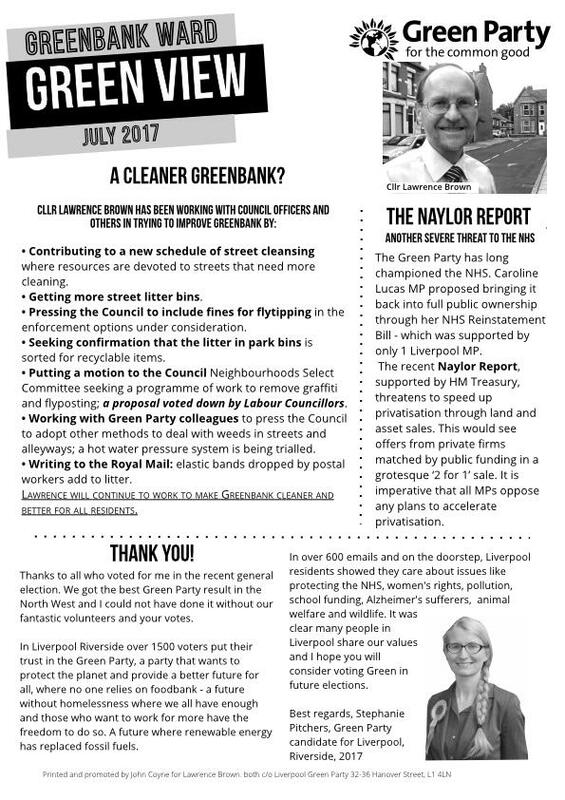 Friday 21st: Lawrence helped out with the delivery of July “Green View” in the L8 area of the ward and responded to further emails/casework requests. The issue of missed bin collections was raised.